► COMPATIBILITY - Orboot app is free on iOS and Android. Compatible with - iPad 3rd gen & above, iPad Air all models, iPad Pro all models, iPad mini 2 & above, iPhone 6 & above; Android 3GB RAM and above. 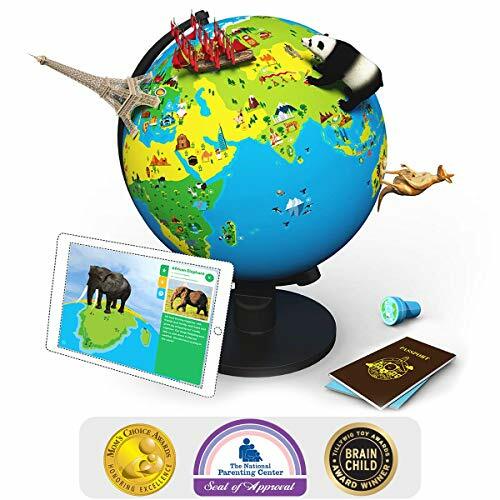 ► THE BOX comes with a 10" globe, passport, stamp, country flag stickers, and a detailed help guide. ► CATEGORIES IN APP - cultures, monuments, inventions, animals, maps and weather for various countries across the globe. ► STEAM Ahead - A perfect toy for the ever-curious kids that sparks their imagination and curiosity. It helps build knowledge, linguistic and cognitive skills. Makes for an amazing and unique gift for kids! If you have any questions about this product by Shifu, contact us by completing and submitting the form below. If you are looking for a specif part number, please include it with your message.